New at See Song Designs – Rings! If you haven’t noticed, there are quite a few new jewelry pieces in the shop. One of the big changes to the line is the addition of hand made rings! One of my longtime goals has been to add rings to See Song Designs. The idea of making rings using fire and metals has always intimidated me, but I knew rings would really complete the collection and I kind of just love wearing rings in general 🙂 Last year, I finally took the dive and enrolled in a basic metal-smith class. I was able to learn the fundamentals of soldering and shaping metal, and it was an amazing experience. 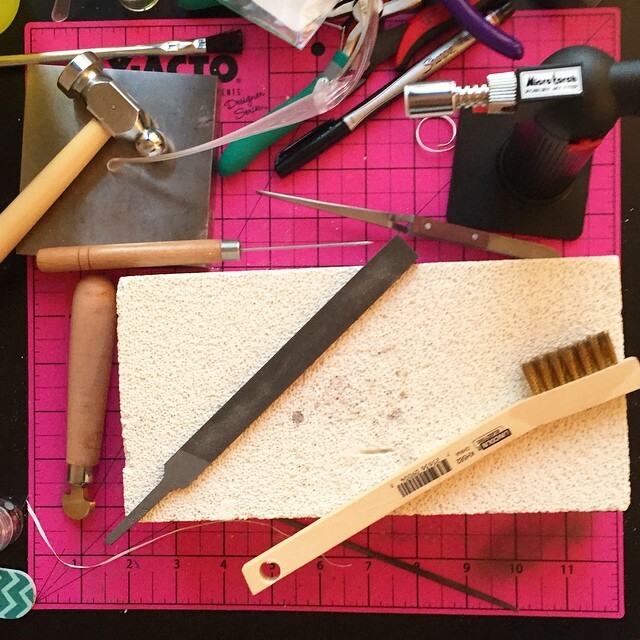 A look at my ring making station with my once super scary metalsmithing tools. Since then, I have been working on honing and improving my techniques to finally bring you some beautiful simple rings for the new See Song Designs collection. All of the Opal Rings are made of 16 gauge 14k gold-filled which has a solid layer of 14K gold bonded with heat and pressure to a base metal, which lasts for many years, even with daily wear. Since each ring is handmade, you are able to get lots of customization. There are 5 multi-dimensional colored synthetic opals to choose from, and you can choose if you’d like the ring to have a smooth or hammered finish. I also make simple thin band rings which are perfect for stacking and can be made in 18 gauge gold-filled or sterling silver in any size or finish. I personally love wearing the thing rings as stacked midi rings. Handmade Simple Gold Rings – Only $12 each! « Tis the Season… for Shopping!